In recent years, marketers have gotten really serious about virtual reality (VR) and set their sights on using it in their marketing campaigns. 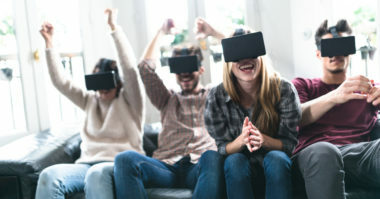 With estimates of virtual reality soon becoming a billion dollar industry, marketers have started exploring opportunities to leverage VR technology to market to consumers and to stimulate engagement. With more VR headsets steadily arriving in households today, VR marketing has the potential for much greater reach and response. To help marketers use virtual reality to maximize their marketing, OnlineCMag.com shared five really effective VR marketing campaigns. Volvo has made VR a really important part of its daily operations. The automaker even created a special VR app to promote the debut of its new XC90 SUV model. The app lets consumers virtually experience the sensation of a high-speed test drive in the actual vehicle. Industry experts have said that this could possibly redefine the test drive in the future. This major publication has been using VR to completely change the nature of storytelling. They first tinkered with the technology in November 2015 by creating disposable virtual headsets called Google Cardboards to promote their VR documentary called The Displaced about children affected by war. The publication distributed one million free Google Cardboards to its subscribers to promote the VR film. They followed up this effort in May 2016 for the release of their second VR film called Seeking Pluto’s Frigid Heart by sending 300,000 Google Cardboards to long-time digital subscribers. The popular food franchise entered the virtual reality arena by allowing its Happy Meal boxes to be folded into VR viewing devices. They named this device the McDonald’s Cardboard VR Headset and it’s currently being tested in Sweden where consumers are encouraged to use their Happy Meal boxes to enjoy a range of VR experiences. One of the most popular is a built-in game called Slope Stars that’s based on a Swedish recreational holiday. Last year around the holidays, Coca-Cola created an app that provided thousands of people in Poland with the virtual reality experience of replacing Santa Claus. The app offered a VR video experience from the viewpoint of Santa’s sleigh ride, so people could virtually soar through the skies delivering gifts like Santa Claus. Marriott has been using virtual reality to give consumers a virtual vacation. The hotel chain partnered with Framestore VR Studio and Relevant to advertise vacation getaways through VR experiences. Marriott is now using the technology to let people virtually escape to a Marriott hotel room and experience the real-life sensation of exploring must-see destinations. Get a better view of the latest in virtual reality marketing. Contact MDG Advertising.